My dad, Marty Skibosh, passed away 31 years ago when I was 38. I think of him everyday. So when another Father’s Day comes and goes, it will hit even closer to home. Marty, one of my four children and one of the two who don’t smoke, went to the hospital one time. My dad pointed out the mess in the machine that came out of his lungs to my son and told him “That’s what happens when you smoke.” He never forgot it. My dad, who worked at Allis Chambers, was an entrepreneur before I even knew what that word meant. He left his job and started a grocery story out in Brookfield on Bluemound Road in 1953. It was called ‘Martin’s Market Basket.’ He and my mother, Angie, ran it, like they did everything in their lifetime – together. When the big grocery chains started to take over, they decided to turn their grocery story into a pizza restaurant and ‘Marty’s Pizza’ was officially born in 1957. Once again, my dad and mom, worked hand-in-hand to build a business that is still successful today under the new ownership, which purchased the place in 1980 and kept the name and most of the recipes. 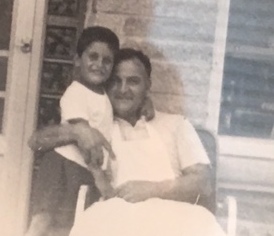 I loved my dad, who was so different from my mom, and I took after the latter. My dad was a quiet man, with a dry sense of humor. He rarely raised his voice, but when he did, my mother and I knew we were wrong. My mom and I always argued – but neither held a grudge. My dad used to tell me “Both of you have to have the last word, that’s why you argue so much. Let her have the last word.” My dad might have lost some battles but he won the war. But like my mom, I liked to win those battles. My dad and I didn’t have a lot in common – he loved to fish and he hunted a little – and I didn’t have the patience for either. We would get up at 4 a.m. and go out on Pewaukee Lake. I would usually sleep in the bottom of the boat or read my comic books. But one night, the fish were biting and I caught 18 White Bass. I pulled them in, but my dad had to unhook them and put the new minnow on the hook because I couldn’t stand touching the minnows or the fish I caught – they were so slimy. But my dad smiled a lot that morning, because he saw me enjoy fishing – for probably the only time in my life. On one of his few hunting trips where he was gone for a week, I really missed him. When he returned I ran out to the car to hug him and he scared the heck out of my because he had grown a scruffy beard. But I owe it to my dad for getting me involved with baseball. We went to a Milwaukee Braves game once when I was about 8 years old and he asked for tickets between first and second. The gentleman selling tickets told my dad their was only one seat between first and second and that was for Chuck Cottier, the Braves second baseman. So my dad asked for tickets on the first base side and we ended up all the way down in the right field extension. From that day on, I learned how the sections were numbered and where all the box and grandstand seats were. It paid off over the years. I went on the play baseball – I was a good fielding first baseman who could bunt – not a lot of need for that on most teams. I also played the line in football and had a heart that was bigger than my muscles, but I loved being part of a team. I owe that all to my dad. He let me play the sports that I enjoyed and did not force his interests on me. One thing he had trouble doing was playing catch. He broke his right wrist when he fell in a construction site he shouldn’t have been it. He had an indentation in his wrist that back in those days they couldn’t fix. But I loved him for trying to play catch with me. A couple Christmases ago, my youngest daughter, Tina, found a photo of me and my dad, sitting in front of Marty’s. It hangs by my desk today and it still brings tears to my eyes when I look at it. Dad, I still miss you. Very Much.